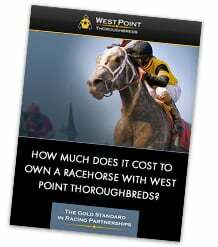 Why Choose West Point Thoroughbreds? 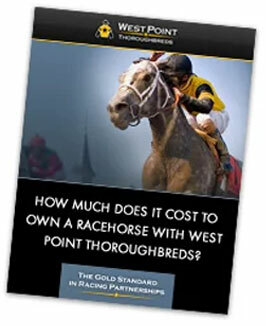 How Much Does It Cost to Own A Racehorse With West Point Thoroughbreds? It costs less than you might think. Get the FREE report! © 2019 West Point Thoroughbreds, Inc. All rights reserved. We are not affiliated with the Military Academy at West Point. PLUS WE'LL SEND YOU INFO ABOUT EXPLORING OWNERSHIP YOU CAN REVIEW AT YOUR OWN PACE. EDUCATION IS A HUGE PART OF THE WPT EXPERIENCE.